Roland Orzabal and Curt Smith could be forgiven for guffawing at the concept. 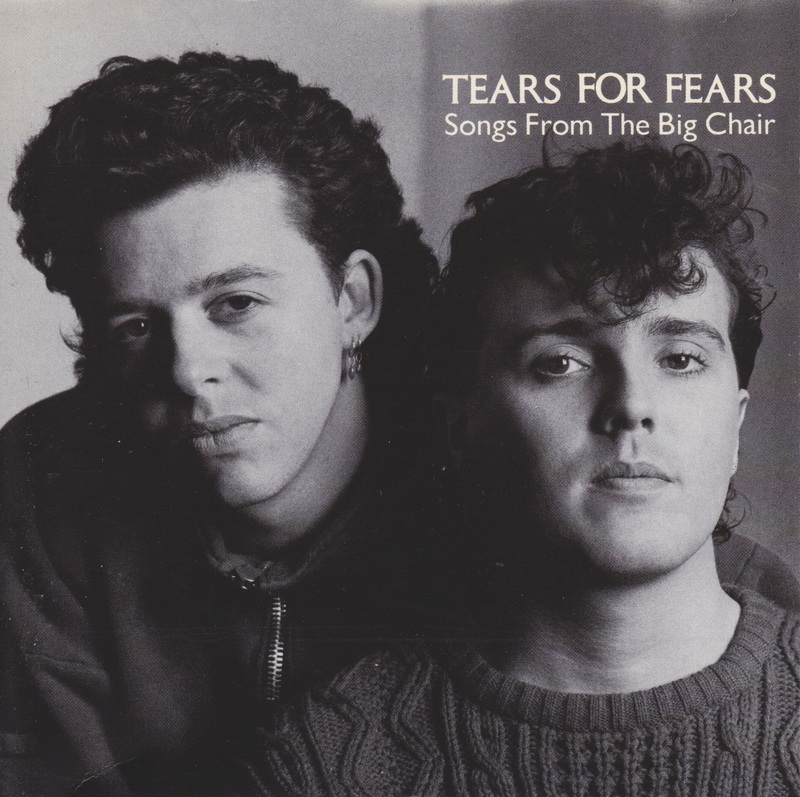 Though the history of popular music is littered with examples of artists who have followed up sensational debuts with mediocre efforts that prove the theory of the treadmill of the music industry not being conducive to artistic creation, the release of Songs From The Big Chair in February 1985 saw Tears For Fears spectacularly buck that tendency. Their second album catapulted them into the ranks of the superstar, courtesy of two American number one singles, heavy rotation of their videos on MTV and eight million album sales in the UK and US alone. Interestingly, this phenomenal success was preceded -- and possibly even brought about -- by a bad patch for the duo. Two singles -- "The Way You Are" and "Mothers Talk" -- had fared relatively poorly in the charts, something which reflected a creative uncertainty following the dizzying success of their first album, The Hurting. Smith later revealed that he enjoyed recording neither song and that he and Orzabal realised something was wrong, namely absence of rawness and adultness in their music. "Rock and roll was a dirty word to us before" Orzabal would comment, "which is ludicrous... This (Songs From The Big Chair) has got a very basic excitement in it that was lacking in our earlier work." They started taking their cue from acts that those familiar with their music might be forgiven for thinking the unlikeliest inhabitants of their turntables. Asked about their favourite current artists when mixing Songs From The Big Chair, the duo came up with a decidedly "rockist" list: ZZ Top, The Stranglers, The Blue Nile and Bruce Springsteen. Though proud of their first album, they were big enough to admit deficiencies. Orzabal acknowledged, "I suppose some of The Hurting was kind of sixth form poetry stuff." Smith observed, "There was no humour involved, no diversity -- which isn't necessarily a bad thing but people decided it was our whole personality and slagged us off, which was upsetting." The pair now set about consciously expanding the looser, less uptight side that they felt had always existed in their songs and made it the dominant part of their sound. One of the reasons for the public's massive vote of approval for Songs From The Big Chair must be the fact that this "Let's rock" policy ensured that their second album displayed little of the melancholy that made their debut alienating to some. Whereas The Hurting had been a rather brooding work, Songs From The Big Chair achieved the trick of marrying The Hurting's classy tunes and irresistible hooks to punchier instrumentation and a brighter world view. The sound was bigger and bolder, courtesy of the enhanced contributions of supporting musicians Manny Elias (drums), Ian Stanley (keyboards) and Mel Collins (sax). Their significant input into the songs was recognized with co-writing credits, in various configurations. Also receiving a composition credit (on, lucratively enough, "Everybody Wants To Rule The World") was Chris Hughes, retained as producer from The Hurting. All this made for an album full of anthemic, life-affirming material in the mould of Orzabal's heroes The Beatles. Unlike The Hurting, there was no way this record was going to be accused of being comprised of "music for people in bed-sits." Consistent with the interest in matters psychological which had given the duo their name, the album's title was inspired by the TV mini-series Sybil, first broadcast in 1976. Directed by Daniel Petrie and starring Joanne Woodward and Sally Field, the series was a sort of TV version of the movie The Three Faces Of Eve, dealing as it did with a woman with multiple personalities (seventeen, in fact). It was widely failed as a well-acted and disturbing drama and won an Emmy award. The Sybil character only achieves something close to happiness when located in what she terms her analyst's "big chair." Smith: "The big chair is the place where she feels safe, without the threat of other people. Likewise, the album's just saying what WE want to say. We don't care what other people think about it." "Big Chair," the B-side of the single "Shout," is -- obviously -- inspired by the same source and indeed features samples of the series' dialogue. "Everybody Wants To Rule The World" could be said to have had a career of its own. Only kept off the number one spot in the UK by USA For Africa's "We Are The World," in the US it was number one for two weeks and was so loved by radio stations that by October 1994 it had already racked up two million broadcasts. Predictably, it won in the Best British Single award category at the Brits (Orzabal would complain that it should also have won the Ivor Novello International Hit of the Year award, claiming that the actual winner, "19" by Paul Hardcastle, wasn't a song but a dialogue collage). Impressive as its immediate impact was, the longevity of "Everybody Wants To Rule The World" was even more stunning. After the band rewrote it as "Everybody Wants To RUN The World" for use as the theme tune for Sport Aid week, the amended song reached the UK top five for the second time in February 1986. Incredibly, "Everybody" almost didn't make it onto the album, as Orzabal and Stanley thought it lightweight. It was only the intervention of Chris Hughes, who felt it to be the American single the album needed, that ensured it was even recorded. Calculated? "Totally" Orzabal admitted. "But if you've got the talent to do it, why not do it? It turned people onto other songs that they might not otherwise hear. And it's still a classic single." "Shout" became the duo's second US number one single in August '85. In the UK, its release had actually preceded that of "Everybody" and it hit the number four position. As for the parent album, Songs From The Big Chair was number one in the US for five weeks, going quintuple platinum (sales over five million). It only reached number two in Britain but still earned triple platinum status. Some critics at the time were heard to complain that a mere eight tracks didn't really feel like an album, regardless of the songs' individual running times. This reissue may well placate those dissenters, for the generous helping of bonus tracks means the song total has now been doubled. Instead of simply pulling another single from the album (as they did twice more in America with "Head Over Heels," which hit number three in November, and a re-mixed "Mother's Talk," which reached 27 the following May), Orzabal and Smith decided to issue what they titled "A Soulful Re-recording" of one of the album tracks closest to their hearts. "I Believe" stalled at number 23 but they weren't worried about the modest chart showing, as sentimentality rather than commercialism had motivated its release. It had originally been written with ex-Soft Machine vocalist and drummer Robert Wyatt in mind. Wyatt, confined to a wheelchair after falling out of a window at a party, is probably best known for his Communist politics and his emotional anti-Falklands single "Shipbuilding" (written by Elvis Costello). All this talk of chart position should not give the impression that Songs From The Big Chair's success was confined to the commercial realm. Anything but. Roland Orzabal was granted the ultimate artistic accolade when he received the prestigious Ivor Novello award for Outstanding Songwriter of the year, meanwhile the affection stirred in people's hearts by "Everybody Wants To Rule The World" acquired it an almost instant immortality as it made a seamless transition from feature of the hitlists to the staple of Gold radio station programming that it is today. So much for Orzabal's -- no-doubt tongue-in-cheek -- comments toward the end of '85: "I always compare Tears For Fears' success to that of Herman's Hermits" he implausibly asserted. "Like them, we too will be forgotten in 20 year's time." Ladies and gentlemen, for your listening pleasure, Tears For Fears.